In its recent press release, the BoE takes great pains to point out that the way money is really created is: 1) the opposite of what most (almost all) people believe, which is that banks lend deposits or excess reserves or pre-existing money—none of that is true—and 2) contrary to, indeed, the “reverse” of what “some economics textbooks” say. The BoE wants to be clear about this, then, and get us all on the same page, and that page is that banks make up money out of thin air and “lend” it to you, which is an absurdity and an insult on its face. The BoE wants to be sure you understand that banks are “loaning” you made-up money that they do not have because somehow, you got the damn-fool notion that they loan out deposits instead of funny money. Oh, you probably got that notion from one of those dreadful textbooks in your government school. Pish posh, old chap, that was a bloody lot of nonsense, stories for boys and all. Pip pip cheerio and all that rot. And we should add here that although this press release comes from the Bank of England, the statements it makes about money creation apply to all commercial banks in modern economies, including the United States. Indeed, the press release references material from former Federal Reserve chair Ben Bernanke, a publication from the Minneapolis Fed, and a 1963 article written by the late James Tobin, a Yale economics professor. Just making that clear for those who might wish to dismiss these mind-boggling statements as being exclusive to the Bank of England. So in their academic tomes that generally only they read—the insiders, the ones really in the know—they’re quite honest about what is here called “endogenous’ money, which is just a fancy way of saying “the bank makes up money out of thin air.” Meanwhile, in the dumbed-down versions that they write for the consumption of us common folk, they, um…fudge a little bit. Or a lot. Whatever. 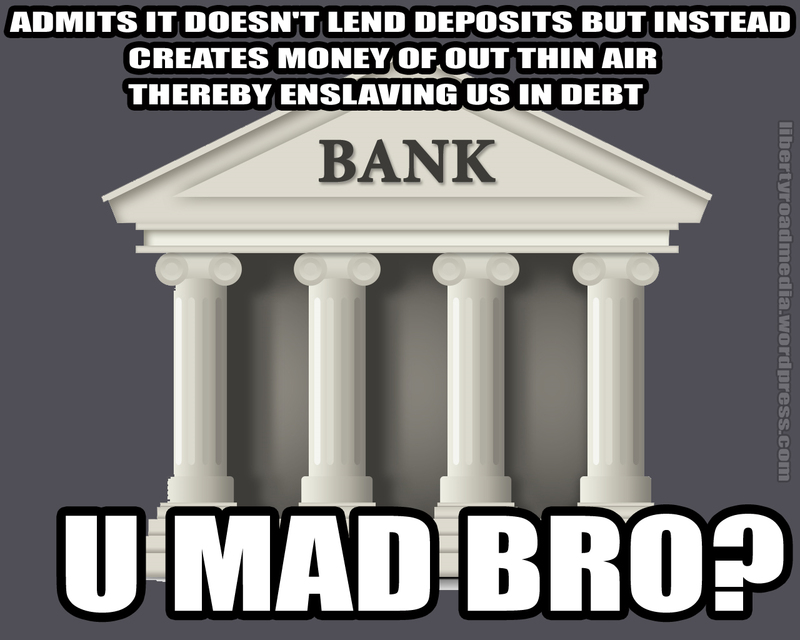 Long story short, they make you think that banks lend deposits. That’s where you got that idea—that you now know isn’t true, right? This entry was posted in Asset Bubble, Bank of America, Conspiracy, Debt, Debt Slavery, Everything Is Rigged, Federal Reserve, fiat currency, Financial Terrorism, Foreclosure fraud, Keiser Report, Redistribution and tagged Bank of England, Ben Bernanke, big lie, central banking, commercial bank, currency, deposits, Federal Reserve, fiat money, fictional money, James Tobin, lending, loan, Mein Kampf, mind control, money out of thin air, myth, reserves, textbooks. Bookmark the permalink. Love that video, Shelley! Of course all this isn’t news to a lot of us on the front lines fighting the banks, but lots of people find it unbelievable, yet there it is in black and white.